She has a passion for all things equestrian, so naturally the Duchess of Cornwall looked overjoyed when she was treated to a display of precision riding reminiscent at an Indian military academy. I don't think so either. Even Charles and Diana early on had more "loving looks" than C and C have now. Camilla is happy she got all the marbles and I think that makes her happy. Charles likes the attention of appearing before the "peasants". Exactly what I see in most pictures. He looks waaay more miserable than he did with Diana. Hm. Be careful what you wish for, Chuckles. ^Ok, I take it back. These are great PR or just natural shots and Cams looks like she's had some good work done to pick up her face, lousy bra or not, and they look comfortable with each other. Nice photos. Thanks!!!! Oh yeah, he is really miserable. He is in hog heaven being married to her which is having your cake and eating it too for she is his great friend and beard for all of his unacceptable heinous behavior. In a scene reminiscent of the iconic Princess Diana Taj Mahal photo, Prince Charles and the Duchess of Cornwall were pictured on day three of their India tour in front of a magnificent Hindu Temple complex. And earlier in the day the couple became Slumdog royalty, where Charles was given an early birthday surprise. The gesture came courtesy of pupils at a school in the Govindpuri slum in the south of the city, a labyrinth of filthy two and three-storey shacks with precious little water or sanitation. One of the largest 'jugghis' in India, with more than 200,000 inhabitants, families with six or seven children cram into a single room. Water-borne disease is rife and rabid mongrels defecate in the streets as children play. In amongst the squalor, however, is the Katha school, a whitewashed beacon of hope for the slum's thousands of children, many of whom would be forced into child labour without its help. Of its 1,350 pupils aged three to 17, 98 per cent pass their state exams while 56 per cent go on to university. Totally agree. Unlike the Duke of Windsor he got it all, even the heirs via his late ex wife. And he takes no responsibility for anything. what a life. The Duchess of Cornwall was moved close to tears today when she was shown round a centre for abused and abandoned children. She met children as young as a three-day-old baby abandoned by its teenage mother and teenagers who had been raped and sexually abused. Despite the horrific stories it was still a joyous and colourful occasion. The Duchess was greeted by a group of dancers in jewel-coloured saris with flowers in their hair, who even managed to persuade her to try out some of their dance moves. The Duchess was shown round a residential block for the centre's youngest residents, where photographers were banned. Meeting a group of children aged three and under, one little boy who was unable to walk dragged himself on his stomach over to her and pulled himself to his feet to be able to greet Camilla. She gently touched his hand and the boy smiled, delighted. She listened intently as one of the staff explained how one child was still unable to speak due to the trauma they had suffered. But it was seeing the youngest children taken in by the centre that really touched her heart. She was particularly moved by the sight of the three-day-old boy whose 15 year old mother had abandoned him and will be put up for adoption. 'You just want to scoop them all up in your arms and take them home,' she said. Camilla seems to love the camera just like Waity. Camilla must think she's God's gift to mankind the way she finds the cameras and grins at them. She must have quite an ego, like Kate does. Just one of the many things Cammie and Waity have in common. THE Prince of Wales and the Duchess of Cornwall may have been many miles away from the UK today, but they still made sure they marked Remembrance Sunday. The royal couple, who are currently on a nine-day tour of India, attended a special service at St. John The Evangelist Church in Mumbai, while the Queen led a service at Cenotaph in London. During their visit today, Charles and Camilla met some of India's last surviving Second World War veterans as they paid their respects to the country's war dead. The pair honoured the fallen when they joined the congregation at the church for an annual remembrance service. Charles, 64, and Camilla. 66, took their seats at the head of the pews in St John the Evangelist Church as it commemorated those who fought in the Afghan campaign of the mid 19th century. Among those in the congregation was Brigadier Furdoon Mehta, 91, the first Indian Army aviator, and Madhukar Dongre, 92, the last surviving recipient of the Burma Star living in India who was a craftsman with the Indian Electrical and Mechanical Engineers. 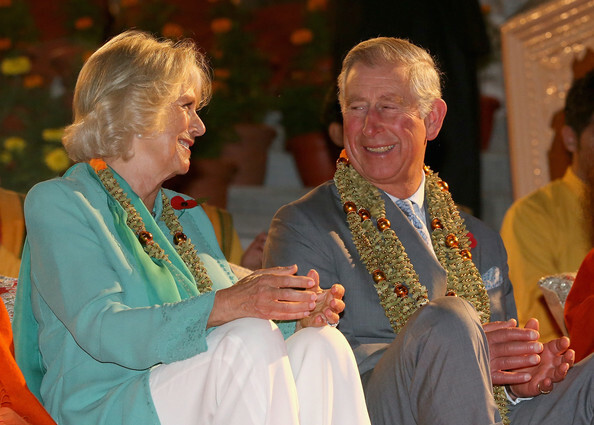 PRINCE Charles and the Duchess of Cornwall celebrated the sixth day of their Indian tour today with a truly colourful welcome to Southern India. The pair were greeted by an array of demons, princes and Gods as dancers with brightly coloured costumes and painted faces performed an short excerpt of a 300-year-old Hindu legend. And it looked as though the royal visitors were more than impressed with their welcome, with Charles even claiming that the performance was "far too short." The performance was the highlight of a tour of the Kerala Folklore Theatre and Museum in Cochin, where other cultural displays were staged for the couple including martial arts fighting and an acrobatic wrestling match. Truth be told, I think Camilla might be a better person if she put up less of a front. It's a front that she is a fully down to earth countrywoman and I wonder how much of it is her overcompensating. She is spiffed up, but I'm beginning to think there is still a lot of ugliness in her that isn't exorcised. She seems to resent that Charles is secure and seems to resent that her life is dependent on him. Women who depend on men to support them never stop envying or resenting women who don't have to do the stuff she did.